You won’t find many people in the world that don’t know who David Beckham is. The Manchester United and England footballing superstar has not only revolutionized the footballing world, but the sporting world as a whole. According to Forbes, the British soccer player is worth $350 million, with a lot more heading his way. It’s reported that Beckham’s shirt and boot sales alone have hit over $1.6 billion over his career for sponsors, making him a giant asset to any company. After his 20-year playing career, 10 million ‘Beckham’ replica shirts have been sold, which could clothe the whole population of Haiti, totaling just under $1.5 billion in sales revenue. So what makes Beckham so influential? After winning the French Ligue 1 in 2013, Beckham became the first English player to win league titles in four different countries (England, France, Spain and the United States). His role in the winning London 2012 Olympic bid, again, boosted his likability within the sporting world, and his ‘James Bond-esque’ torch bearing entrance, won many more female fans across the world. Beckham is one of the most likable athletes in the world, and for good reason. In 2008, Beckham saved England’s European Championship qualification hopes with a goal via one of his trademark free-kicks, in the dying seconds of the game. In 2013, Beckham donated his PSG (Paris Saint-Germain) wages to two French children’s’ charities, just over $5 million. Other honours include an OBE (Order of the British Empire), UNICEF Ambassador, ranked 15th on ‘The Celebrity 100’, and many more. It goes without saying; Beckham’s impact on soccer across the world is stronger than ever, despite hanging up his boots in 2013 turning 40 years old earlier this year. Doubles annual sponsorship and advertising income to $62.3 million within first 2 years of playing. Why is he so important to Major League Soccer? It goes without saying; Beckham’s public image is within the highest echelons of not only athletes but also public figures around the world. 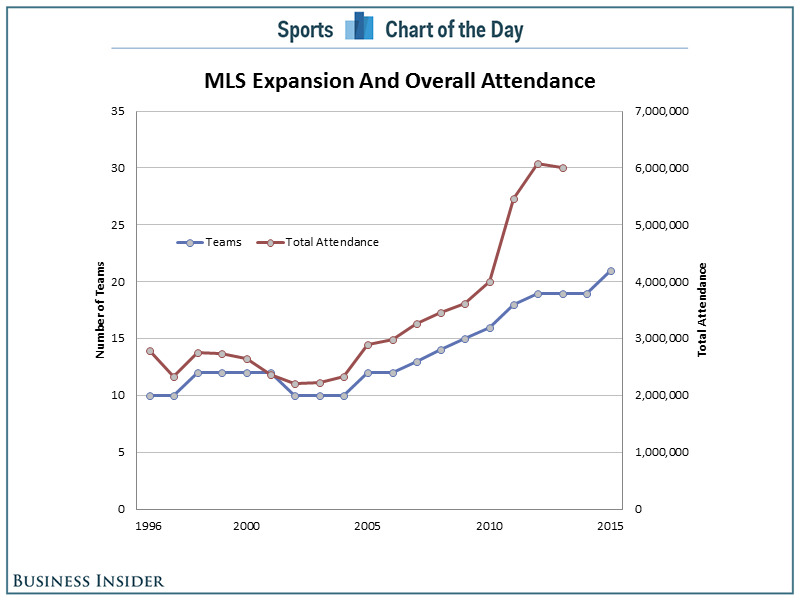 Having him associated with the MLS is an immediate positive for the league, and he has helped growth within the league. His move to LA Galaxy in 2007 started a new era for MLS, sparking many famous faces to try out the American turf. Notable players include Robbie Keane (Tottenham), Frank Lampard (Chelsea), Steven Gerrard (Liverpool), David Villas (Athletico Madrid), Kaka (AC Milan), Andrea Pirlo (AC Milan), and recent Montreal signing, Didier Drogba (Chelsea). You could say Beckham’s move was purely passion based, and that he moved due to the slower pace of the MLS compared to other leagues. Beckham’s impact is not just felt on the pitch, but off it too. His desire to add another MLS team to the roster in 2014 has triggered much excitement among the league, including MLS commissioner, Don Garber. "He has had a lot of fits and starts in trying to build a stadium. You have got to have the right building. We have got to create that new story,” said Garber to EPSN FC. “David is making progress more so than ever before, a site at the former Orange Bowl and adjacent to where the Marlins play." Rumours’ surfacing that international superstar, Jay-Z, wants to invest $100 million into Beckham’s Miami team, but no credible source to this was given. However, in my own opinion, I don’t think it will be too long before there will more high status celebrities wanting to invest in Beckham’s adventures. It would seem, David Beckham’s ‘Golden Left Foot’ is turning everything it touches, into gold.